MIKE S. LEE, PhD, is President of Milestone Development Services. His recent work has involved the development of automated orthogonal control systems for electrospray ionization. Formerly, Dr. Lee was director of analytical research and development at Bristol-Myers Squibb (BMS) Pharmaceutical Research Institute where he led interdisciplinary teams that contributed to the Food and Drug Administration's approval of Buspar® and Serzone®, and the accelerated development and approval of Taxol®. In addition, he has authored over forty scientific papers and issued patents. MINGSHE ZHU, PhD, is a drug metabolism researcher at Bristol-Myers Squibb, where he leads a team that investigates biotransformation in new drug discovery and preclinical drug metabolism and pharmacokinetics in development. His teams have provided key metabolism and disposition information for regulatory approval of Abilify® and NDA submission of Dapagliflozin. Dr. Zhu's research interests include LC/MS technology, optimization of ADME properties, metabolic activation, and regulatory drug metabolism. He has been frequently invited to speak and teach short courses at conferences/workshops and has coauthored over sixty research articles and one book. Preface (Mike Lee and Mingshe Zhu). Part I. 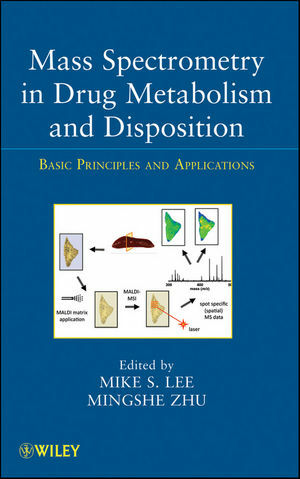 Basic Concepts of Drug Metabolism and Disposition. 1. Progression of Drug Metabolism (Ronald E. White). 2. Common Biotransformation Reactions (Bo Wen and Sidney D. Nelson). 3. Metabolic Activation of Organic Functional Groups Utilized in Medicinal Chemistry (Amit S. Kalgutkar). 4. Drug-Metabolizing Enzymes, Transporters, and Drug-Drug Interactions (Steven W. Louie and Magang Shou). 5. Experimental Models of Drug Metabolism and Disposition (Gang Luo, Chuang Lu, Xinxin Ding, and Donglu Zhang). 6. Principles of Pharmacokinetics: Predicting Human Pharmacokinetics in Drug Discovery (Takehito Yamamoto, Akihiro Hisaka, and Hiroshi Suzuki). 7. Drug Metabolism Research as Integral Part of Drug Discovery and Development Processes (W. Griffith Humphereys). Part II. Mass Spectrometry in Drug Metabolism: Principles and Common Practice. 8. Theory and Instrumentation of Mass Spectrometry (Gérard Hopfgartner). 9. Common Liquid Chromatography-Mass Spectrometry (LC-MS) Methodology for Metabolite Identification (Lin Xu, Lewis J. Klunk, and Chandra Prakash). 10. Mass Spectral Interpretation (Li-Kang Zhang and Birendra N. Pramanik). 11. Techniques to Facilitate the Performance of Mass Spectrometry: Sample Preparation, Liquid Chromatography, and Non-Mass-Spectrometric Detection (Mark Hayward, Maria D. Bacolod, Qing Ping Han, Manuel Cajina, and Zack Zou). Part III. Applications of New LC-MS Techniques in Drug Metabolism and Disposition. 12. Quantitative In Vitro ADME Assays Using LC-MS as a Part of Early Drug Metabolism Screening (Walter Korfmacher). 13. High-Resolution Mass Spectrometry and Drug Metabolite Identification (Russell J. Mortishire-Smith, Haiying Zhang, and Kevin P. Bateman). 14. Distribution Studies of Drugs and Metabolites in Tissue by Mass Spectrometric Imaging (Richard F. Reich, Daniel P. Magparangalan, Timothy J. Garrett, and Richard A. Yost). 15. Use of Triple Quadrupole-Linear Ion Trap Mass Spectrometry as a Single LC-MS Platform in Drug Metabolism and Pharmacokinetics (Wenying Jian, Ming Yao, Bo Wen, Elliott B. Jones, and Mingshe Zhu). 16. Quantitative Drug Metabolism with Accelerator Mass Spectrometry (John S. Vogel, Peter Lohstroh, Brad Keck, and Stephen R. Dueker). 17. Standard-Free Estimation of Metabolite Levels Using Nanospray Mass Spectrometry: Current Statutes and Future Directions (Jing-Tao Wu). 18. Profiling and Characterization of Herbal Medicine and Its Metabolites Using LC-MS (Zeper Abliz, Ruiping Zhang, Ping Geng, Dongmei Dai, Jiuming He, and Jian Liu). 19. Liquid Chromatography Mass Spectrometry Bioanalysis of Protein Therapeutics and Biomarkers in Biological Matrices (Fumin Li and Qin C. Ji). 20. Mass Spectrometry in the Analysis of DNA, Protein, Peptide, and Lipid Biomarkers of Oxidative Stress (Stacy L. Gelhaus and Ian A. Blair). 21. LC-MS in Endogenous Metabolite Profiling and Small-Molecule Biomarker Discovery (Michael D. Reily, Petia Shipkova, and Serhiy Hnatyshyn).